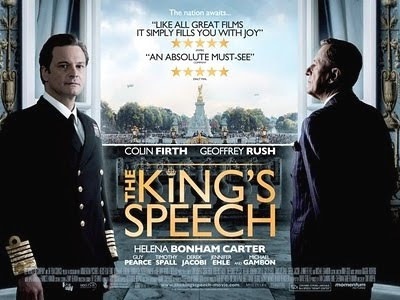 A day after copping the top prize at the Directors’ Guild Award (DGA), The King’s Speech went on to take the top honour (Outstanding Ensemble Cast) at the two-hour Screen Actors Guild’s ceremony, tilting awards season in its favour as Hollywood enters the final stretch in the race to the Oscars, set for Feb 27. The acting frontrunners (Firth, Portman, Bale, and Leo) all obliged in their respective categories. Most notable on the television side, one of the industry’s most gifted and likable stars, The Good Wife’s Julianna Margulies, won the trophy for Outstanding Drama Series Actress for the second year in a row. And Betty White won her first SAG statuette (Comedy actress) for her latest TV role, as a star on Hot In Cleveland. In case you missed last night’s show, here’s a quick recap of the winners. POINT OF VIEW: Tourism Minister ED Bartlett holds the attention of a trio of FLOW reps at the 2011 Jamaica Jazz & Blues Fest in Trelwany. As government minister with responsibility for the tourism sector, Edmund Bartlett always has a full plate, including this past weekend, which saw the 2011 staging of the Jamaica Jazz & Blues Festival that pulled thousands of visitors to the island. TALLAWAH scored an opportunity at the festival to speak with the minister about his tough job, the fate of the Calabash Literary Festival, and taking time to indulge in a little jazz. After an impressive 15 years, what role has the Jazz & Blues Festival played in pitching Jamaica as an ideal tourist destination? To begin with, the Jamaica Jazz & Blues Festival is a major calendar event, and it is what we call one of the hooks for tourism. Events are among the great pulls for arrivals, and the more of them we can have, the more likely we’ll have larger numbers coming to the island. This weekend, for example, all the hotels are full from Lucea back to Ocho Rios. The local people, the small entities, all experience good occupancy and good business because the event is taking place. Over time, we do an exit poll to find out how many people visit, what do they spend, how much do they spend, what are the items that they buy, where are they coming from. So that gives us a good idea of the impact of the festival on the arrivals and the economic activity within the communities around. And last year, some US$3 million was generated on the weekend from the activities. So events like these are not to be seen as just social activities; they bring employment to people and benefits in real terms to the country. What are you thoughts on the Greenfield Stadium being used to host the festival for the second time? It seems a natural choice, and there is something special about it with the ambience of the ocean around you and the waves beating against the shoreline. All of these things create a different sort of setting, and I believe this is a venue that can survive for a long time. Recently, it was announced that the Calabash Literary Festival is traditionally over for a range of reasons. What are your thoughts on this development? Oh yes, I love all forms of music. I like rhythm and blues definitely, but jazz is for the occasion, and when I travel and want to relax, in particular, you can go into a piano bar and catch a few minutes of jazz. So most times when I travel I love to listen to jazz. It seems you have quite a fulfilling role as minister. It’s exciting but it’s very demanding, and it takes all of your spare time and your real time and leaves you with no downtime (Laughs). TV CREW: Tourism Minister Ed Bartlett hangs with representatives from HBO and cable provider FLOW at the Jazz & Blues Fest. GROOVY CHICK: At this year's jazz fest one of my fave moments was getting to finally hear - and meet- 23-year-old Irish-born songstress Laura Izibor, who captivated with her big voice, her humour and breezy aura. Such a classy girl. Importantly, I got to tell her how much I enjoy her album. (FYI: She has a sophomore record on the way). Check out my vid clip of her Saturday night performance of the terrific "Don't Stay" at the festival below. In the press room, Izibor gave took pics with members of the FLOW team. FAME FM personalities Deidra and Claudette Powell (right) shared lens time with the singer. Izibor also posed for snaps with representatives from sponsors Scotia Bank Group. The lovely Regina Belle spoke about music in schools, her love of Jamaican cocoa bread and her performance with Simon Crosskill representing TV J's Entertainment Report. 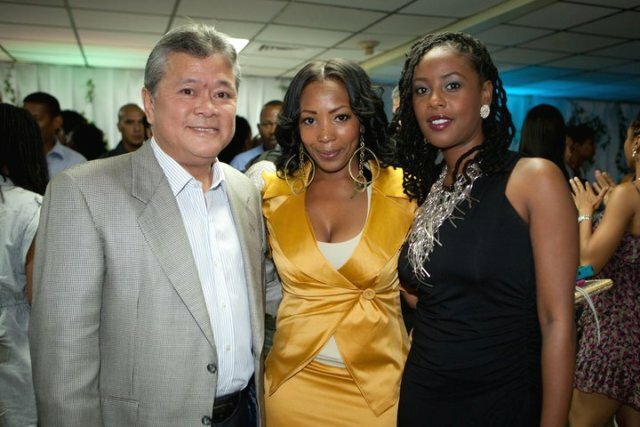 TurnKey Productions head Walter Elmore and a colleague did a photo op with the fab SWV. The ladies of SWV are obviously smitten with RE-TV vj Chike Morrison during an interview. Fresh from their main stage debut, the gentlemen of the group Committed posed for photos in the press room. Like a smooth operator, crooner Bryan Art sang and flirted with his female fans during his stint on the Heineken stage. The Headline girls take a rare breather during one of the breaks in the media/press room. Chanti-I belted out some tender tunes, like Jill Scott's "A Long Walk," on the Heineken Star Talent Stage on Saturday. She was so good I had to compliment her on her awesome vocals after the performance. Such a sweet girl. The Book Industry Association of Jamaica is holding a new competition in 2011. The book entries for the Writing Awards Competition (also called the Readers’ Choice Competition) will be judged by readers from the general public and the winners announced at the Awards on March 24, 2011. A total of forty-one books have been entered in this competition. There are four categories from which readers can vote. The categories are as follows: Best Children's Picture Book, Best Children's Chapter Book, Best Adult Creative Writing, and Best Adult Non-fiction. The competition aim’s to encourage public discussion of books and increase the visibility of the BIAJ National Publishing and Writing Awards. The criteria for nomination are that authors must be Jamaican (born or naturalised) and books must have been published between July 1, 2008 and June 30, 2010. The books are on display at the Kingston & St. Andrew Parish Library (Tom Redcam Drive) and can also be purchased from the following booksellers: Azmart (Barbican), Bookland (New Kingston, Mandeville & Montego Bay), Bookophilia (Liguanea), Fontana Pharmacy (Montego Bay, Sav-la-Mar & Mandeville), General Foods (Ocho Rios), Liguanea Drug & Garden (Liguanea), Manor Park Pharmacy (Manor Park) and Novelty Trading Company Limited (Downtown Kingston). The public is encouraged to vote for their favourite books in each category by ballot at the Kingston & St. Andrew Parish Library or at any of the booksellers listed above. Readers can also vote online by clicking on the ‘VOTE NOW’ icon on the BIAJ Website, bookindustryja.com. CULTURE CLASH: Prime Minister Bruce Golding (left) shares a light moment with Mexican Ambassador Leonora Rueda; South Korean Ambassador, Whambok Cho (right) and High Commissioner of India to Jamaica and the Bahamas, Mohinder Grover. Occasion was the January 24 reception at Jamaica House to mark the annual Diplomatic Week, which is organized by the Ministry of Foreign Affairs and Foreign Trade. The event provides diplomats with an opportunity for dialogue and feedback on areas of mutual interest. FOREIGN EXCHANGE: Prime Minister Bruce Golding received UK Minister of State, Foreign and Commonwealth Office, Jeremy Browne (centre) at a courtesy call at Jamaica House on January 21. Mr Browne said that his government wants a strong, and not only a historic, relationship with its Caribbean and Commonwealth partners, even as it modifies its foreign policies to match current global realities. DIPLOMATIC TIES: High Commissioner of New Zealand to Jamaica, Andrew Needs presented his credentials to Prime minister Bruce Golding on January 24 when he paid a courtesy call on the PM at Jamaica House. The new High Commissioner has pledged to maintain and enhance the close relationships that exist between Jamaica and New Zealand. Noting the efficient and competitive operations of New Zealand’s agricultural sector, both countries discussed the possibility of increasing technical co-operation in that area. PM Golding took the opportunity to express Jamaica's sympathy and hope to be updated on the coal mine explosions in New Zealand. THE EUROPEAN CONNECTION: Jamaica recently received some J$3.4billion from the European Union. The official handing over took place today on January 25 at a ceremony at Jamaica House. The funds have been channelled through the Budget Support for the Security Sector Reform Programme (SSRP), under which over €7.3 million (J$850 million) was disbursed, and the Debt Reduction and Growth Enhancement Programme (DRGEP), through which €21.5 million (J$2.5 billion) was disbursed. This brings the total disbursement under these two programmes which begun in 2009 to €94.5m (J$10.54bn). Seen here making the official presentation to PM Golding (2nd left) is Head of Delegation of the EU, Ambassador Marco Mazzochi-Alemanni (centre). Looking on at are National Security Minister, Senator Dwight Nelson (left); Minister of Finance and the Public Service, Audley Shaw and Minister of Justice, Senator Dorothy Lightbourne. FOR A WORTHY CAUSE: Empress Mullings (right), with business partner Nadia Stanley and businessman Gary 'Butch' Hendrickson, attends the launch of her new issues-and-answers show Talk Up Yout'. Ever attentive to the heart and mind concerns she has for her fellow man, particularly impressionable youngsters, media personality and activist Empress Mullings is determined to help heighten awareness about the issues that matter deeply to Jamaican young people. 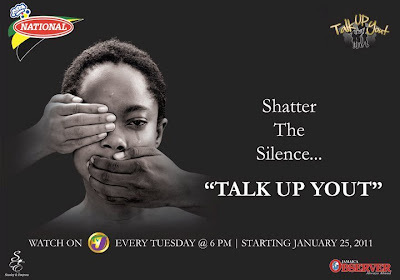 Her buzzworthy new talk show, Talk Up Yout’ (aired Tuesdays on TV J) is one medium through which she hopes to reap some fruit. I think it was sometime last year that I first thought about it, and I worked on developing it straight into this year. And when we spoke with TV J, they believed in the project; they loved the idea until we signed off on it. And it was the same with our print partner, the Observer. Everyone saw the vision in the first meeting. It is a topic that is very important, and Jason [the show’s guest] is a great spokesperson on the matter. Certain issues are not being given enough attention, and so we are pushing for young people to be more aware. Next week, for example, we will be doing a show that looks at skin bleaching. The whole issue of Black people bleaching their skin is something that is very timely. There are certain things in society that should not be promoted, so we will be having two young people on the show to help us with the discussion. RAYON McLEAN: Is this young man the next big thing in Jamaican theatre? 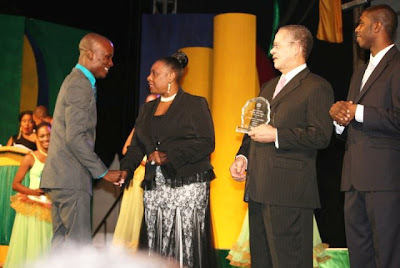 ARTIST APPEAL: McLean gets warm congrats from culture minister Olivia Grange, PM Bruce Golding and Senator Warren Newby at Sunday's PM Youth Awards at Jamaica House. Depending on who you ask, Rayon McLean is destined for great things. The unwavering signs have been obvious from his days at Clarendon’s prestigious Glenmuir High School, where he excelled in academics, youth leadership and as a key member of the school’s multi-award-winning festival choirs and speech ensembles, taking home several medals and trophies in the JCDC Festival of the Arts. Now enrolled at the Mona campus, the university’s artistic circle has benefited remarkably from his talents. 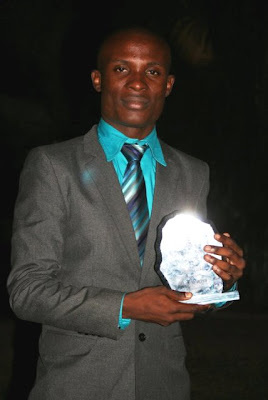 Just this past November, he wowed theatre lovers as director and lead of the fascinatingly clever experimental presentation Apostrophe in the popular tertiary drama competition, Tallawah, picking up top prizes for Best Production and Best Director. And to further add to his credits, he has worn the director hat with the Jamaica Youth Theatre as helmer of the bold and thought-provoking production Graffiti, which impressed critics here and as far as Europe, and has been named one of 2010’s top ten Jamaican stage works. And as his star continues to rise, the accolades keep rolling in. Last Sunday, McLean was presented with the Prime Minister’s Youth Award for outstanding achievement in the arts. Since, I have found myself imagining that for someone barely brushing the early 20s, McLean has attained much and seems poised to further surprise the local theatre scene, granted that he maintains – and expands in due course – his grasp in the theatrical arts. His acting has the potential to astound (For Black Boys comes readily to mind) and for a young director he displays considerable ability to engage his viewers as he gets his fellow young performers to do just that – perform. There is evidence in his work that he thinks deeply about what he’s doing or attempting to pull off, and that’s a crucial trait for any serious artist. We can never have enough shining talents willing and able to deliver for the benefit of the ever-struggling arts. So as he prepares to make a real foray into premiere-league theatre, it remains to be seen whether McLean, definitely one to watch, also possesses the requisite endurance to ultimately deliver what so many of us have realized he is capable of. SWEET FACE: "Teisha Duncan and Maurice Bryan to host 2011 Actor Boy Awards," announces Beharie. As the exhilarating awards season deepens, one of the hardest working women behind the scenes of the annually successful Actor Boy Awards, Scarlett Beharie, is hard at work with her team putting things in place for another stellar star-studded event this year. TALLAWAH got some deets on what we can expect, as well as her reflections on the past 12 months of Jamaican theatre. When will this year’s Actor Boy nominations be announced? A date has not been fixed as yet, but we are aiming for mid-February. When is the awards show slated to take place? Are there any special plans for the 2011 event? We have not yet decided on the details of the show, but it will involve a bit of song and dance as hosted by Teisha Duncan and Maurice Bryan, who both have deep roots in musical theatre. Has this year's special honoree been selected? Yes. The Schools’ Drama Festival, for their 60 years of steadfast contribution to the development of Jamaican theatre by providing an avenue for expression and training of young performers islandwide, and by extension unearthing numerous talents that have continued to entertain us while nurturing the field. What are your thoughts on the overall offerings in Jamaican theatre in 2010? 2010 has been an impressive year that provided us with a range of theatrical experiences spanning a number of genres, including musical, drama, comedy and farce. Christine Bell returned to the stage after 8 years to do a one-woman play and Amba Chevannes’ little play that could from the KOTE show in aid of the Theatre Artist Benevolent Fund. Debra Erdthart found her way back home after fleeing it, according to her play Jamaica Farewell, which was the second one-woman show of 2010. We had a play with an all-male cast and three successful remounts and at least 15 original stagings. It was a year that saw semi-professional and youth groups rising to the fore with impressive pieces from the University Dramatic Arts Society and the Jamaica Youth Theatre. December saw six new plays premiering, as many plays as there are theatre spaces. 2010 was a strong indication that theatre continues to be a significant part of our entertainment landscape, but it also highlighted the challenges that producers face in bringing plays to the public due to the small number of performance and rehearsal spaces available. 2010 says that we have done very well, but with more support in terms of infrastructure, talent, training vision and collective industry we could still do much, much more. REMEMBER MY NAME: The cast of the Jamaica Junior Theatre Company perform a number from their new musical, Fame. The television smash hit Glee and Disney’s successful High School Musical franchise have demonstrated that ambition and talent are not lost on the young. Like their adult contemporaries, young artists can be startlingly headstrong and occasionally cruel in the pursuit of their artistic dreams. But anyone watching can’t deny that these kids are having a helluva load of fun revelling in the performing arts. 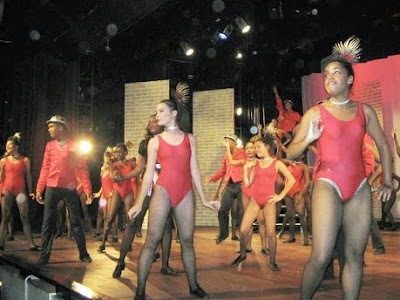 This month, the same can be said of the over 50 performers who populate the 2011 Jamaica Junior Theatre production Fame: The Next Generation, a revival based on the successful eighties film and television show now playing at UWI Mona’s Philip Sherlock Centre. The show, directed by Peter Haley (with choreography from Tony Wilson and musical direction by Douglas Bennett) is set at a performing arts college in Atlanta, but the setup is pure high school, baby. There’s the requisite teen romance, the preppy girl who likes to make herself the centre of attention and a bit of uninspired conflict. But that’s not to say that the show doesn’t go anywhere. In fact, it’s a lively, song-and-dance filled production, and Wilson does an impressive job choreographing the musical numbers, which border on invigorating and vividly show off Carolyn Chin Yee’s terrific costumes. But the plot is generic and the characters never rise beyond a single dimension. Henley does manage, however, to pull commendable performances from standouts David Reid, Stephanie Hazle and Matthew McKenzie. There are humorous moments and the show is a bit more involving than previous productions I’ve seen from the JJT. The kids have fun with their parts, some more gratifying than others, and save a big burst of exuberance for the grand final number, the popular “One,” from Broadway’s A Chorus Line.